Behold the irony of casting Brad Pitt as Tyler Durden. He is the closest thing to perfection that a movie maker could ever ask for and yet he is commanding other to glory in their imperfections. In Fight Club it is Brad Pitt, of all people, who says, “The world tells us we’ll all be movie gods and rock stars… But we won’t. And we’re slowly realizing that fact, and we are very, very pissed off.” Yeah right. 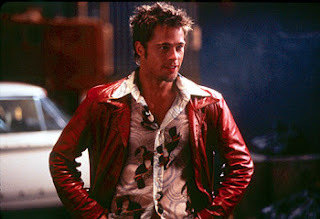 Tyler Durden, the fictional revolutionary represented by Brad Pitt, the movie star, makes as much sense as steering an ocean liner through a sea of jagged icebergs. The supposedly flawless, unsinkable ship doesn’t stand a chance against this cold, hard mountain of contradiction. True, this floating mountain is fleeting, it will melt back into the ocean pretty soon, but it’s not nearly as feeble as Brad Pitt’s attempt at balancing his love for perfection with a supposed love for imperfection. His ability to tread the icy waters of reality must eventually wear out; eventually his voice gurgles, his lungs gasp for one last breath as unchanging, spiritual undercurrents overwhelm him. Why does he sermonize about things he has never believed in? It sounds like he’s got the right answers now, but soon he’ll be remembered only for this last, crowning act of futility. He’s already almost done with his final performance, even the most sophisticated film archives will soon sink beneath the murky depths. Picture the “very pissed off” speech from an outside perspective… I can see the director yelling into his loudspeaker, “Okay, cut! That’s it for today folks. Great job, Brad! Oh yeah, and you too Edward…” People pat each other on the back as the night crew moves in to clean up the mess. Brad and Edward give out a few autographs before they climb into their ridiculous cars (Brad’s is a tad shinier than Edward’s) and drive home to their cookie-cutter mansions (Brad’s has a few more flying buttresses than Edward’s) so they can freshen up for their upcoming performances. :) You really don't like this bloke do you? I see your point in this. A big name star does sell tickets however. i actually think Brad Pitt is an amazing actor. I'm reading this in 2012 so um "belated" is an under-statement. I don't think it is ironic, the split personality created was everything that the world wants us to be which is why Brad Pitt works in the role. The point being those of us who are imperfect strive for perfection, and Pitt as Tyler Durden representing someone perfect striving for complete imperfection. It doesnt mean that he believes in the stuff hi character says. He's "acting" after all. He's being paid to do this and the words of tyler durden is the words of the writer and not of brad pitt. So I dont know why you have it out for him so much.